"Welcome to the Shift Age"
taken from "Entering the Shift Age". Parts One and Two of the book. eBook 1 introduces the reader to the concept of The Shift Age and the Three Forces that will drive and define the Shift Age. This is a crucial read for those who haven’t read The Shift Age and a perfect refresher for those who have to help them understand the reasons behind the significant changes we are now experiencing. Part 1 welcomes you to the Shift Age and explains the new age we have entered. We look back on the Threshold Decades, the 20 years leading up to the Shift Age and why it really was the threshold between what was and what will be. Part 2 is about the Three Forces of the Shift Age. All the change you are now experiencing can, in large part, be traced back to one of these three forces. In my travels around the world, speaking to numerous different industries and markets, the reaction to the presentation of these three forces has always been the same; that these forces clearly explain why each industry is experiencing dramatic and often disruptive change. 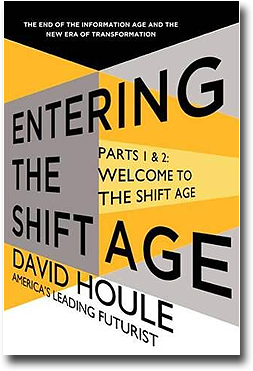 This is the first mini-eBook from "Entering the Shift Age" to purchase as it sets up the entire book AND will let you determine if you want to read additional eBooks or "Entering the Shift Age" in its' entirety.